A newspaper set up by an ex-Johnston Press journalist in competition with his previous employer has been sold for an undisclosed sum. The monthly Scarborough Review, launched by former Scarborough News sub-editor Pete Spence in August last year, will now come under the ownership of York-based Your Local Link Media, although Pete will retain shares in the business. In the last few months Pete says the Review has increased in pagination from 36 to up to 52 pages with an increase in print run to 11,000 copies, and also an increase in outlets offering distribution of the free title. As editor he will continue to be responsible for content within its pages following the takeover. Said Pete: “The Scarborough Review is still very much a local newspaper covering Scarborough, Filey, Hunmanby and surrounding villages. “To have the backing of a company like Your Local Link Media Group is absolutely fantastic and means the Review can progress to the next level. He declined to say how much the title had been sold for. 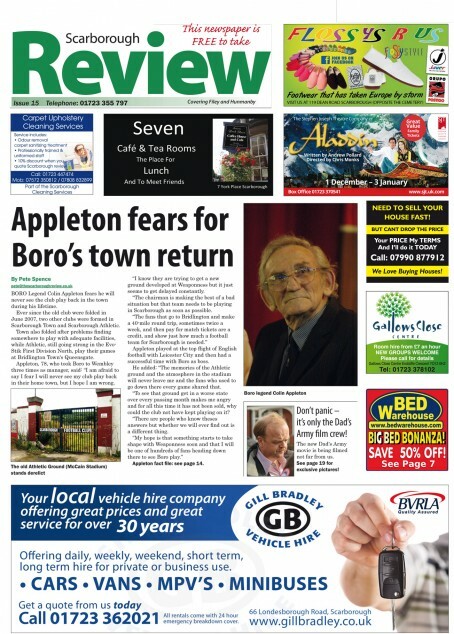 Pete’s decision to launch the review came after Johnston Press’ decision to switch its Scarborough News title from a daily to a weekly publication in 2012. Your Local Link managing director Gini Guttery said: “The Scarborough Review is unique in that it is setting the trend against the negative things that are happening with local newspapers. One in the eye for JP! Well done Pete, hope it continues to work out well for you. Nice that you have positive backing but still enjoy the hands-on editing aspect that you obviously relish. Maybe this is the way forward for ex-JP staffers elsewhere in the country? There is another free paper starting in Scarborough next month it seems so a good time to get out maybe? I think if JP had a bit more competition like this they might take note of the people who really know their business, those on shop floor and not the likes of parachutist AH.When they did have really good sales complacency by editors on some of their so-called flagship papers cost them readers long before digital arrived to complete the rout. Their free papers are abysmal and a decent rival would put them to shame. Good on you! All the best. No lack of morale at this publication, obviously. Run a paper properly and it will pay. JP are chasing the fools gold of digital with it’s associated cuts, cuts and more cuts. Is it any wonder that their products are declining sharply. Soon JP won’t have any readers, advertisers or future. @Desker – my understanding is that the new paper will be a paid twice-weekly?